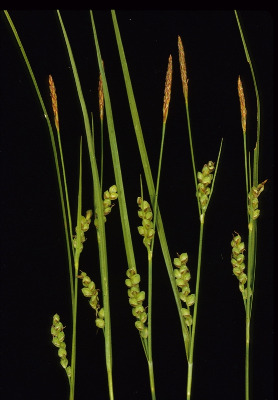 Fens, sedge meadows, shores, interdunal swales, wet depressions in prairies, occasionally on limestone pavements, rarely in drier sites; a plant of calcareous soils but very local northward. See note under C. ormostachya (sect. Laxiflorae). MICHIGAN FLORA ONLINE. A. A. Reznicek, E. G. Voss, & B. S. Walters. February 2011. University of Michigan. Web. April 20, 2019. https://michiganflora.net/species.aspx?id=1064.